"I don't know if my trooper would be alive today without his assistance," Milstead said. 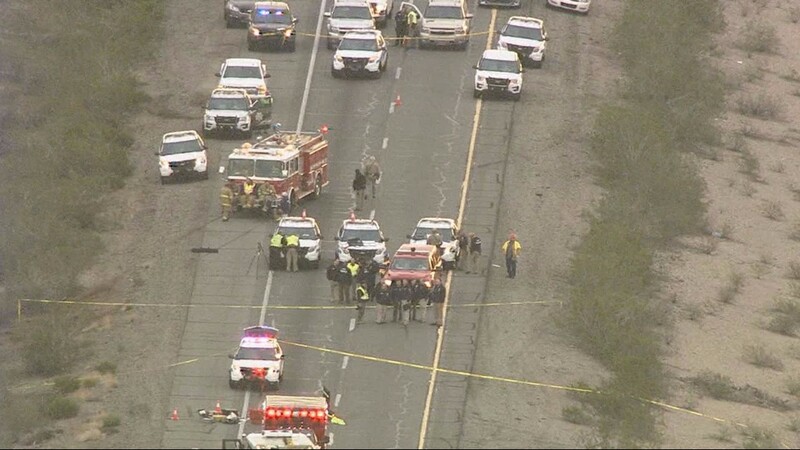 TONOPAH, Ariz. - A suspect is dead and an Arizona Department of Public Safety trooper is recovering after he was ambushed and shot early Thursday on Interstate 10, according to DPS officials. Authorities say a possible motive for the attack on the trooper remains unclear. DPS officials say Anderson spotted the wreck as he responded to a report of shots being fired at another motorist's vehicle. Milstead said a call came in early Thursday morning from a driver who said their car had been shot at from the median of I-10 at milepost 81 -- just east of California. A woman had been ejected in that crash -- she was later pronounced dead. The suspect shot the trooper in the right shoulder, and was "getting the better of the trooper" in a fight that immediately followed. The suspect died as a result of the shooting and the man called for help using the trooper's radio, according to Milstead. Hundreds of cars were stuck on the interstate before sunrise, as the Arizona Department of Transportation closed westbound I-10 near Tonopah during the investigation. The agency arranged a local-road detour during the I-10 closure. It is not known whether the initial shooting call is connected to the incident. The investigation is ongoing and the identities of the trooper and suspect have yet to be released. No word on when the interstate will reopen. Part of I-10 westbound was closed for the investigation after a DPS trooper was shot while responding to a wreck, Jan. 12, 2017.